What will California need to do for a successful secession? I have been a strong advocate and defender of secession movements. I encourage independence whenever and wherever possible. I was pulling for Scotland and I was happy for the UK when they succeeded in passing their referendum to leave the EU. Decentralization is a fantastic step toward freedom. These are charges typically – though not ALWAYS – lead by the right leaning parties. Certainly in the United States, secession is a movement the more conservative wings have coddled. Not to say that they’ve done more than talk about it, but it’s a talking point they embrace. I’m not a “We The People” sort of guy. I’m more of a “We the Individuals” sort of guy. So anything that pushes for individual self-governance is better than the collectivist alternative. So imagine my surprise to see so many BLUE states rally behind the idea of secession upon realizing the results of this election season. California had an internal secession movement for some time, where it would break up into as many as six separate states. The movement was called “Six Californias”. It never made the ballot, but regardless of whether it was ever feasible or plausible that the federal government would sign off on such a thing is not the point. Conservatives felt under-represented in a blue state, and they felt their voices would be heard if the state was broken up. 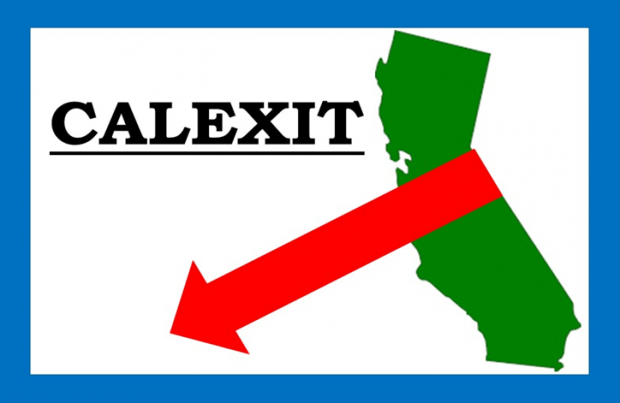 Predicated on a similar premise, there is a new movement called CalExit which calls for the entire state to secede from the union, as the liberals of California are frustrated that their voices were not heard in this last general election. Oregon has a secession movement as well, but I want to focus on California because it is the largest economy in the union. In a distant second is Texas. California also happens to be the 6th largest economy in the world (which I will address a little later). California’s ranking fluctuates a bit, but it is the only STATE listed on a global economy list. The US is the largest economy, followed by China, Japan, Germany, and the UK. California is recovering from her recent plummet following the housing crisis, and as of this year holds a prominent position after the UK and above France. California is home to some of the largest industries, many of which are more by default than by any sort of economic stimulus or government incentive. It’s the largest agricultural and dairy state. That’s a climate and regional thing, more than because California is just do dog-gone great. It has a HUGE coastline to go with said climate, which spans about half the western seaboard of the union. So everything from import-export to tourism just fell into California’s lap as well. California’s government claiming credit for that is like New York claiming credit for Niagara Falls or Arizona claiming credit for the Grand Canyon. It’s not like their respective governments did anything to create those things. And the aforementioned industries in California are there despite its government. There are other white collar industries that are in California for the prestige of having a Los Angeles or Bay Area zip code, and they pay a premium for that status symbol. Large insurance firms, financial institutions, ad agencies, and last but certainly NOT least, tech firms. And finally there are the juggernauts of media, aeronautics and defense contractors. For as much as these blue state politicians build their careers deriding the friendly tax exemptions for large corporations, no one has done a damn thing to close those loopholes in California. Now let’s consider a liberated California! The good news is, it keeps all the federal income tax money it was sending to Washington DC. Believe it or not, California isn’t very federally codependent. It would likely be better off without federal assistance in the end. Not sure if the same could be said for Texas. Let’s circle back to California’s global economic ranking now. If we factor in the high cost of living, the list looks a little different. California slips to 11th in the global rankings because it doesn’t emulate the rest of the United States on that front, but rather that of Western Europe. California’s debt and liabilities also seems to emulate many Western European countries. Between its cost of living and its ledger, it would seem the Golden State needs to revisit its economics. In terms of a balanced budget, California technically has what it is required to spend cash on this year, however, California’s unfunded retiree health care costs grew more than 80% over ten years. Healthcare for current and retiring state employees. This ALONE can land California into a $300 billion hole by 2047. Bond debt. Despite California having the 4th highest fuel tax in the union at $0.385/gallon, it can’t seem to afford its own highway system because it is largely infrastructure that these bonds are going toward. As for the rebuilding of schools, while it has a lower property tax than many other states, it has higher property values upon which to levy that tax. Essentially, the government is getting in its own way of becoming independent from the union. California will need to abandon a lot of its government to make secession a reality and a success. Its government is far too generous to itself, far too bureaucratic, and over-regulated. What has so many scoffing at a CalExit isn’t that it’s not capable. It most certainly has the potential of being one of the greatest secession stories to hit modern history books. Their large government with a hat-tip to its various unions, make it an economic dead-end. It recently saw the first bump in 14 years to its bond credit ratings: from A+ to AA-. Fourteen years to get to a AA-? How does it expect to sustain its own currency? California most certainly COULD, but it won’t. Not until it breaks its addiction to government. It is, however, a perfect example of wasted potential. The fire in your belly over not getting the candidate you wanted isn’t enough to extinguish the unfunded liabilities. Likewise, the fire in the bellies of Texans to secede won’t compensate for their heavy dependence on federal funding and contracts. I do like how secession is becoming less taboo and more a commonplace topic of conversation; in the same way like how expatriation has become a more acceptable solution for many Americans. Perhaps the first step in substantive change is a shift in national discourse? If so, then we might very well be on our way! Why stop at just California? Oregon probably would also like to leave and there are the states of the Northeast like Maine, Vermont, New Hampshire, Massachusetts, Connecticut, Rhode Island, New York, Pennsylvania, Maryland and Delaware that could morph into one country. Texas, Alaska and Hawaii would also probably also like to be independent. The one thing that I would personally insist on is if they have the option to leave that they allow the Libertarians to have their own country of Montana, Wyoming and Idaho which I think should be named the Jefferson Republic and would b a beacon of liberty to the rest of the world. I have several reasons for wishing CalExit will happen, but will focus on my two main reasons for supporting it. One is that many of the environmental restrictions (I hate to say “regulations,” since they do whatever they can to not make things regular) that have found their way to the national level were jump-started in California. These all got onto the national scene because of California’s outsize effect on the national economy. They were able to dream up rules for automakers that originally applied only to their state. But since their state accounts for more auto registrations than any other, the manufacturers didn’t want to have to make one vehicle for California, and another for the rest of the nation. The second is the electoral/political map. This would banish 10% of the nation’s electoral vote with one action. Suddenly, there would be 55 electoral votes that would not be a sure thing for the Democrat column every four years. This alone would force a more moderate direction for the national political model. Thanks for the commentary Kevin.